Football mania reached fever pitch in the city as the Mumbai Football Arena in Andheri Sports Complex became host to the latest Mission XI Million Festival. With less than a month to go for the FIFA U-17 World Cup India 2017, children from different schools gathered and celebrated the beautiful game in large numbers and with great enthusiasm. Students of different age groups from all around the city started trickling inside the venue early in the morning and in no time the place was bustling with youthful energy. Even more, energy was visible on the pitch when students came down in batches to take part in small sided football games. To cheer the playing kids, Aaditya Thackeray, President of the Mumbai District Football Association was also present at the venue. 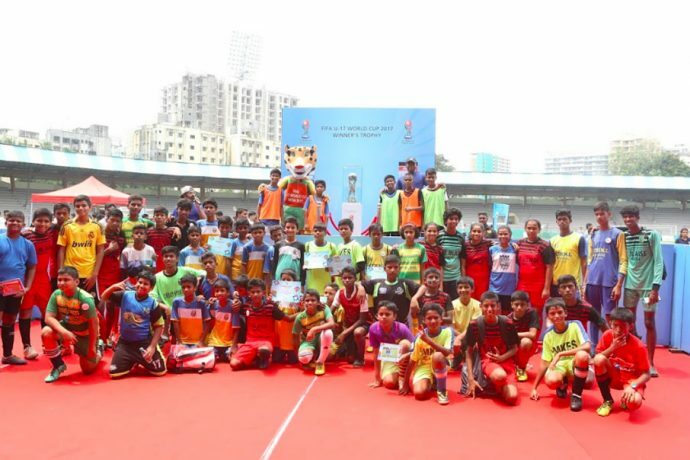 The FIFA U-17 World Cup Winner’s Trophy was a major attraction for the kids as well as their teachers who lined up in queues to get clicked with the same Trophy that will be handed over to the winner of the tournament on 28th October. Also present at the venue was Kheleo, the Official Mascot of the FIFA U-17 World Cup India 2017, who entertained one and all with his antics and obliged his fans by posing for selfies and photographs. Tomorrow, as part of the ongoing Trophy Experience, the FIFA U-17 World Cup Winner’s Trophy will be present at the Gateway of India between 4 pm and 8 pm and Mumbaikars can come and witness the beautiful silverware at the iconic location.